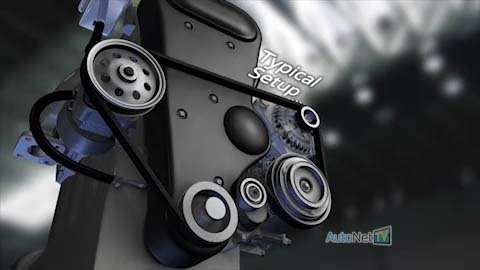 Ask Hines Service Center: What Happens When a Serpentine Belt Breaks? The serpentine belt is aptly named since it snakes around under your hood. It may lack its namesake's fangs, but it sure packs a wallop when it breaks. The serpentine belt powers a lot of engine systems. It runs the alternator, which charges the battery; the water pump (on some vehicles), which cools the engine; the air conditioning, which cools the driver and passengers; and the power steering pump, which allows for easier steering. When the belt breaks, all of these systems shut down. Okay, so maybe you can live without air conditioning and power steering for a while, but your battery can't live very long without an alternator, and when the cooling system goes down, your vehicle engine will overheat. That's why Conway drivers should never wait to get a serpentine belt replaced. Serpentine belts are fairly inexpensive at Hines Service Center in Conway. And they look downright cheap when you compare them to the cost of an overheated vehicle engine, a tow truck, time lost on the road, inconvenience, and the potential safety consequences of being stranded. Good car care means never putting off preventive maintenance. Do yourself a favor. Ask your friendly and knowledgeable Hines Service Center technician to glance under your hood and give that serpentine belt a quick look-over.